is paris always a good idea? : smart move! As of June 4th, 2013, I'm proud to announce that me, Madame Coquine (okay, the Madame makes me sound like I run a brothel in Pigalle. Nice.) has received her very first, and honestly hopefully last :::drum roll please::: smart phone! I know, I know, what's the big deal, hasn't everyone had one since like 2009? The answer to that is no. For me, this really is big news. After having a variety of Nokia phones since 2003 without internet functionality, a camera, a touch pad, and fun things like a Anti-Drunk Dial App (where was this app during most of my 20s?? ), I feel overwhelmed with the amount of information I have at my finger tips at. all. times. Does this mean I get to take photos of my food now? Or invade the Eiffel Tower's privacy with hourly photos of her, supported by braggy hashtags? Or even better, take Instagram selfies in the bathroom mirror demonstrating my juiciest Janice Dickinson face? Perhaps not (the duck lip photos do sound tempting though...), but it does mean that I won't get lost anymore, that I will respond to emails and texts quicker than before, be on time, and will now be able to capture a quick and pretty "vintage" photo without my eight pound camera weighing down on my neck. It really is a new era. Somehow this makes me feel like more of an adult than being married, which I have to tell you guys, still sounds so weird to me. Well Aurélien did a chest shimmy over his cheese plate last night when I referred to him as my husband, so apparently I'm not the only one who is getting a kick out of this. Now that I have Paris' most-stolen device in my pocket, some changes will need to be made. Long gone are the days of whipping out my phone on the metro line 2 to announce that I'm on my way home. I don't take well to being robbed, so unlike the last time, I will work harder in avoiding it. The wedding dust has finally settled, I am adjusted back into normal life; I have been reconnecting with friends and family, am back at work, and am enjoying gorgeous weather that we so rightfully deserve. If you feel inclined to catch a few glimpses of life off the blog, I invite you to follow me on Instagram! well that was quite the build up...too funny..I too am the proud owner of my first smart phone..HTC windows phone and I love it..for years I was the lone holdout with my crappy slide keyboard dinosaur...now the world is really at your fingertips...hopefully in France you have cheaper options than we do here...having a smart phone here is like having a second mortgage...enjoy and can't wait to see our snaps. Madame...love that. The world is at my fingertips! It's so awesome. One instant change I have noticed is that I have been in touch with a girlfriend (who did come to the wedding) who hates FB/Twitter but loves Instagram. Thanks to the smartphone we're more connected than we have been in years!! My forfait is just 20 euros/month with unlimited calls to America. Pas mal, eh? Have a lovely weekend, Deb! Ha! Congrats! I'm loving being more disconnected in Paris with my fancy 1998 Nokia ;) but I'd appreciate a map every now and again. I hear you, girl. That has been me up until a few days ago. I liked being disconnected - the only thing was when I came home, I needed a good hour to catch up on everything. So now everything just sort of trickles in which has been an interesting change. But my first few years were where you're at. Enjoy the "you" time! Congratulations! I still remember when I got rid of my antiquated flip phone, all my real estate colleagues used to have a blast making fun of me and my phone...oh the good old days! In Paris I tied my iPhone to my bag with a chain...hahaha...I know, a bit paranoid but it worked and gave me lots of peace of mind when I took it out to snap a pic or just check something out. I did get a couple of weird looks but who cares, my phone went to and came back from Paris with me, all in one piece. Smart phones are the best, it is like having a freaking pc on the palm of your hand. Love them! People really do get a kick out of folks who are technologically behind, don't they? My friend's husband would literally be rolling on the floor laughing when he would see my old phone! The chain is a fantastic idea! I would have loved to see someone TRY to swipe that from you, all to learn that it is attached to you!! Bwuahahahaha! Those thieves would have really been thrown off! Can someone tell me why my HEART was pounding uncontrollably while reading that built up? Seriously what did i think you were going to announce being in your 30's and recently married? *exhale* that was a close one. PS. Don't discard of the old phone -you'll need it one of these good old days. I totally agree with this- it's my 20 Euro Nokia that saves the day when the battery on my smartphone dies! I am so sorry! I didn't mean to be that dramatic! I really have to stop doing that! WOO HOO!!! Thanks for welcoming me into the club of smart phone owners! I feel kind of cool now! And don't get me started on Instagram, I'm kind of obsessed. Thanks for the tip! The old phone is safe in our "IT Department" aka a draw of wires, extension cords and chargers. Have a nice weekend Mlle. Petit! How sad though that we've come to a point where we can't take our phones out on public transportation for fear of their being stolen... but they're expensive devices, and so easy to do away with. I hope you took insurance. The build up was way too suspicious and a picture of Brigitte Bardot?? Now way! No, there is no baby-making action happening over here....not for a while if ever. The chest shimmy was pretty awesome...and of course it was over the cheese plate. I held out until a couple of years ago (and always had a very uncool phone up until then), but I really do think it's worth it. Mobile internet isn't always all it's cracked up to be, but I download all the newspapers before I leave the house and am never short of something to read on the metro these days! You got us going there!!!! Well frankly I don't know how you have lived without one till now. Especially being a famous blogger!,,,and young and all! As you know I am "of a certain age" and still I have had a smartphone since Iphone 3. Now I have a Samsung galaxy 3S, ( It's a bit bigger you know for my old eyes.) It is wonderful, not just for instant information, keeping up with blogs and emails reading books, camera etc. but the GPS helped me the other day when I got hopelessly lost on my bike.......actually a phone is the last function I use on it. I love the idea of the chain from Sylvia. Where did she get that. I still notice the Parisiens are busy playing their games on the metro, but like you I am a bit wary of taking it out in public in Paris. Incidentally, me looking at my phone all the time and it pinging...... it drives my husband mad. Ps....this is why I have all the typos and spelling mistakes on my posts becuse I use the smartphone all the time. I too have the Samsung Galaxy! What I should have included in the post was that Aurelien wanted a new phone, so he just passed on his old one that is in perfect shape. I like the large screen, and it seems to be easier than the few times I attempted to use an iPhone. Ahahaahah my phone now makes all sorts of noises too! I jump because I'm not used to it. It comes in handy when notifications come in. I find that I'm less on my computer now! My heart was pounding as well with that build up! Glad to hear you have a Smartphone! It really does come in handy for directions. French cities are so tough to navigate with all the twisty streets! I don't use mine for email (it's too slow..).. Mostly for taking Instagram pics and calling/texting. Already following you on Instagram. :) Yay! "Aurélien did a chest shimmy..." aww! Oooooh sorry! 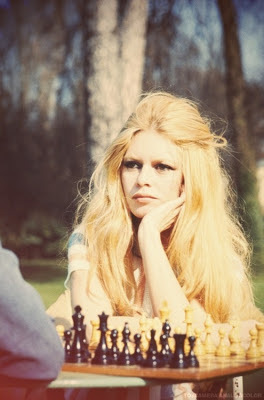 If I was announcing bébé I would definitely not include a photo of crazy old Brigitte Bardot to supplement the post!